Dr Eklabya Sharma, DDG, ICIMOD interacting during the popular lecture session. In set, Dr P P Dhyani and Dr R C Sundriyal of GBPNIHESD. The GB Pant National Institute of Himalayan Environment and Sustainable Development (GBPNIHESD) in Uttarakhand, India organized the 19th Himalayan Popular Lecture on 12 July 2017. The lecture, titled ‘Importance, Changes, and Resilience Building in the Hindu Kush Himalaya’, was delivered by Eklabya Sharma, Deputy Director General of the International Centre for Integrated Mountain Development (ICIMOD). Sharma highlighted various aspects of the Hindu Kush Himalaya, emphasizing the significance of mountain ecosystems, the challenges faced by mountain communities, and various initiatives being taken to address resilience building in the Hindu Kush Himalaya (HKH). GBPNIHESD initiated the Himalayan Popular Lecture series to understand and get views and opinions on complex mountain socio-ecological systems from outstanding scholars representing various fields of expertise, including grassroots level workers, scientists, artists, activists, planners, and community leaders from the Himalaya. 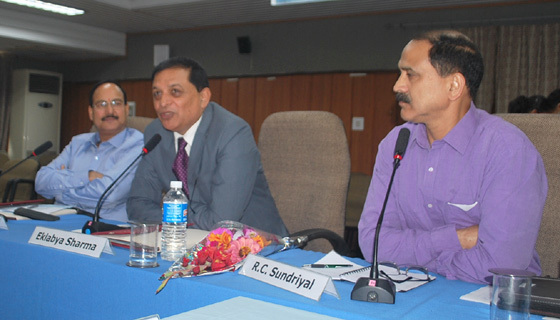 The series has engaged well known personalities such as SS Garbyal, Director General and Special Secretary, Ministry of Environment, Forest and Climate Change, Government of India; KC Pradhan, Former Chief Secretary, Government of Sikkim; and Chandi Prasad Bhatt, Uttarakhand, among others. 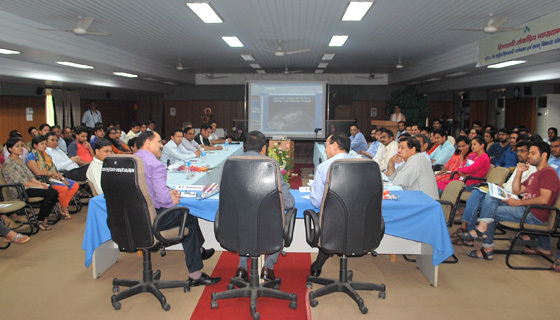 GBPNIHESD faculty and research team during the during the popular lecture session. The 19th Popular Lecture was organized at the GBPNIHESD Headquarters in Almora and attended by about 100 faculty and research team members from GBPNIHESD. Introducing the lecture, Pitamber P Dhyani, Director of GBPNIHESD, highlighted the achievements made by the institute over the last 34 years since its establishment. He highlighted the contributions the organization has made towards enhancing science, including new discoveries, policy and capacity development, and conservation interventions. RC Sundriyal, a scientist at GBPNIHESD, introduced Sharma and his achievements in the field of mountain ecosystems. He highlighted Sharama’s contributions to GBPNIHESD as an alumnus of the Sikkim unit. He also spoke of Sharma’s academic excellence and recognition through awards such as the ‘Young Scientist Award’ given by the Indian National Science Academy and the ‘Eminent Scientist Award’ given by the Ministry of Environment and Forest, Government of India, and Sharma’s appointment as Fellow of the Indian National Science Academy, among others. Book launch on ‘Butterfly Diversity of Surya Kunj’ by Dr R S Rawal, Dr P P Dhyani, Dr Eklabya Sharma, Dr R C Sundriyal and Er Kireet Kumar during the event. Sharma started his presentation by expressing gratitude for the recognition and being given the opportunity to be the nineteenth presenter for the Himalayan Popular Lecture Series. He spoke about the importance of global mountain ecosystems and their contributions to humanity through various direct and indirect ecosystem services. Sharma also highlighted the importance and significance of the HKH in its role as the ‘Third Pole’ and a source of water for one of the most irrigated regions in the world. He talked about rich biodiversity, cultural diversity, and diverse ecosystem services catering to 210 million people living in the region and an additional 1.3 billion living downstream. The presentation also touched upon various drives of change, including climate change, and their existing and potential impacts on HKH ecosystems and human wellbeing. Sharma cited numerous examples on water related disasters, earthquakes, glacial change, and elevation shift of oak trees as a result of climate change, among others. He highlighted some of the interventions made by ICIMOD through its six major programmes focusing on community warning systems on flash floods, landscape and basin level initiatives for integrated approaches to conservation and development, and adaptation and resilience programmes, among others. Citing examples of Resilient Mountain Villages, Sharma explained key elements of the resilient framework and explained how the same is practical and solution oriented. 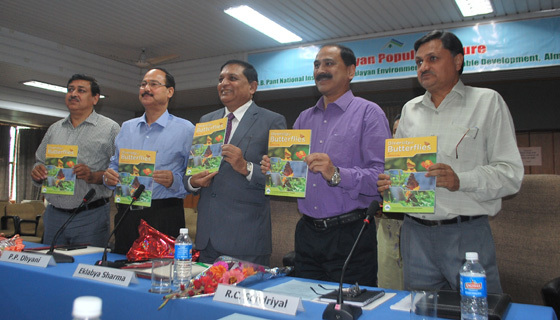 The session was followed by the launch of a book titled ‘Diversity of Butterflies in Surya-Kunj’ and discussions on the importance of a microbial world in sustainable development, practical challenges for implementing new frameworks on the ground, and efforts necessary for highlighting mountain issues in global forums. Dhyani suggested that United Nations recognize a Himalayan Day through its General Assembly. The series concluded with a vote of thanks from Kireet Kumar, a scientist at GBPNIHESD.